Sabah Electricity Sdn Bhd (SESB) has been urged to explore new energy sources and applications to strengthen its electricity generating capacity. 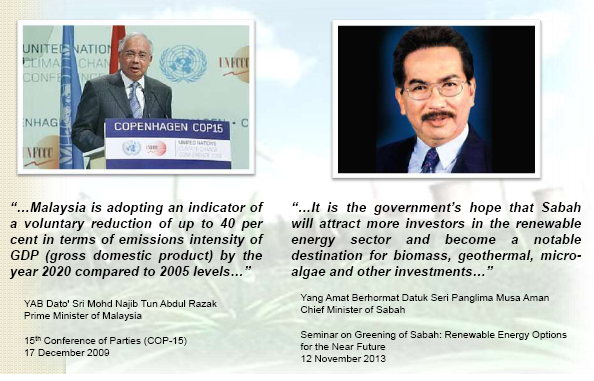 Chief Minister Musa said this in reference to renewables during the recent Sustainable Energy Convention 2013 held at 1Borneo Hypermall last week. It was vital for the State’s sole electricity provider to find a cheaper and more sustainable approach in keeping up with the growing power demand, given the increasingly high cost of operating using conventional fossil fuel. At present, the electricity generating capacity for Sabah and Labuan stands at 1,000 MW, compared to peak demand of up to 874 MW. Out of this, 111 MW was from renewable sources, such as mini hydro and biomass. Ideas, planning and suggestions are to be discussed by the power company, related government-linked agencies and the State Government to ensure smooth and speedy implementation. The governments, both at the state and federal level, would be committed in supporting the power company in their effort to improve their services and ensure power security for the State. “The State Government realises that the operation cost for providing electricity is huge. Apart from expensive equipment and maintenance, SESB and independent power plants have to deal with high and unstable prices of fuel. We are prepared to give cooperation and support to ensure improvements could be implemented successfully." - Datuk Seri Musa Haji Aman, Sabah Chief Minister. TheGreenMechanics: Quality of services provided had seen improvement with a notable reduction in power disruption in recent years, but it had yet to meet the expectation of consumers in Sabah. I have personally encountered difficulties in applying for shutdowns to facilitate connection works to the utility's grid, most probably due to their attempt to reduce SAIDI. At the least, I can say this is unfair. On the sort of support the state government is giving to the Renewable Energy initiative here, it is understood that it is looking at ways to contribute to SEDA fund in lieu of the consumers.